Four young Dominicans from a group called R.E.A.L. 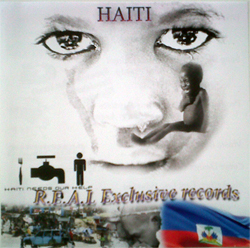 Exclusive Records have written, recorded and produced a song dedicated to helping Haiti. By the following Monday, the song was at the radio stations and being played throughout the country. The group then sought funding from Youth Development Division and were able to produce 300 CDs. 50% of profits go to the Clean Water Campaign for Haiti. The Clean Water Campaign is organized by Lifeline Ministries (headed by Tina Alexander). It is a EC$20,000.00 project where portable water filters are being purchased at 30% of cost. Geest is shipping them from England to Santo Domingo, DR for FREE and the organization has to arrange to get the filters to Haiti. The plan is to have a portable filter at every church so that there will be clean drinking water available. R.E.A.L. Exclusive is a group comprised of a dozen members, young men between the ages of 14 – 18 who are either at high school (Orion Academy, DGS, SMA, Goodwill Secondary) or college level. All of them have strengths in one aspect of music creation, whether it be writing, singing, rapping, making beats, producing, editing, playing instruments, or DeeJaying, as well as promotional aspects such as photography and graphic design. Locally, CDs are available at the Dominica Grammar School, The Sports Centre (The Zone in Canefield) and Radiance Beauty Salon on Independence Street, Roseau (opposite Dr. Debra Williams’ office). EC$10.00 per CD – it is a single with an instrumental version. I love this SONG!!!!! WOOOHOOOOO!!!!! GOOOOO ANDY AND CURWIN!!!! YOU TOO TOFER!!!!! WOOOOWWWW!!! !